After a long time, i doing CCC challenge. Cooking from a cookbook challenge, hosted by +Srivalli Jetti, a weekly event, where we cook a recipe from a cookbook, magazine cutouts or our own scribbled book of recipes. This month, i m planning to do this CCC, on a theme. I have chose Beets as my theme, will be posting Beet recipes for all the weekends this month. The first in line, is this yummilicious thogayal, which is a regular at home. 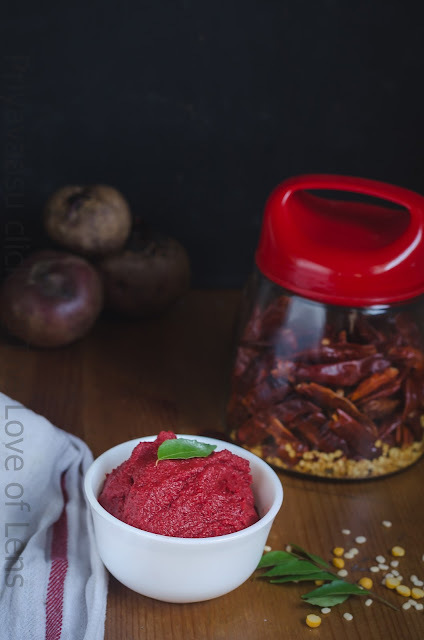 Firstly i lovvee the color💓, secondly the thogayal tastes so yumm, lil spicy, a lil tangy, that even a beets non-lover for its sweet taste, will fall in love with this thogayal. This recipe is from my notepad where i note down the recipes i get from every source. The recipe is inspired from +anusha praveen. She in one of her Lunch posts, mentioned about this thogayal. When i asked her casually, she immediately messaged me the recipe. 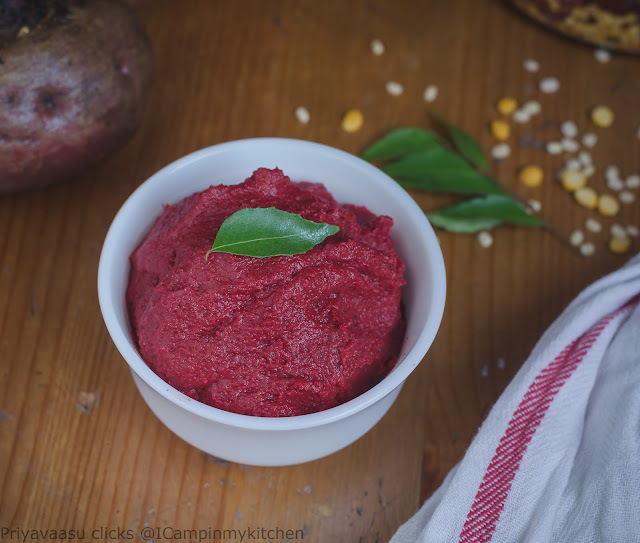 I cook the beets in the microwave and grind it along with other ingredients of the thogayal, but it can also be shredded and sauteed in the pan and then ground to chutney. But this method is pretty easy and less work. Do try and let me know how you liked it. Wash, peel the beets, chop into 1 inch cubes. Take it in a microwave safe bowl, add water to immerse the beets. Microwave high for 8-10 minutes for the beets to cook. Remove for the microwave. There will be very less water left in the beets, strain the water and use it for cooking pulses or add it in rasam. I do the later, gives a nice color to the rasam. Keep the cooked beets aside until use. In a kadai, dry roast urad and chana dal. Take care not to burn them. They should turn golden brown. Just before switching off, add red chilies and curry leaves. Let this cool completely. 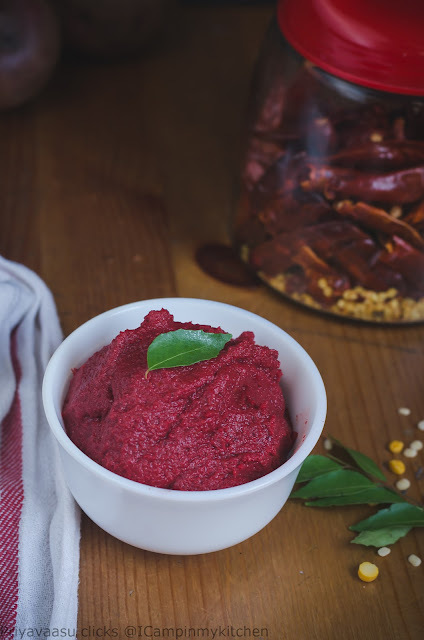 Take the roasted dal, red chilies, curry leaves, tamarind, hing, salt and cooked beets in a mixer, add coconut if using, and grind it to a fine/coarse chutney with 2-3 tbsp of water. Do not add more water, it will become loose. Transfer the thogayal to a serving bowl and serve it along with steaming hot rice and gingely oil and pair it with any dry curry for a scrumptious meal. The colour looks amazing Priya..I am so glad you picked up a theme for this as well..makes it more interesting right..
Never made a chutney with beets -- that sounds delicious. Will have to try it out some time.